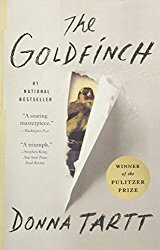 I have been noting little errors and inconsistencies while reading The Goldfinch, and I thought I’d document them. This doesn’t mean I don’t like the book. I love the book. The quirky flaws make it even more precious to me. By the way, this isn’t a full review. I haven’t even finished the book yet. The first inconsistency is right on the first page. Main character Theo says he doesn’t know a word of Dutch, then a few sentences away he refers to the people as dames en heren, which is Dutch for ladies and gentlemen. This particular error is probably intentional and tells the alert reader that Theo is a bit of an unreliable narrator. Later errors are probably not intentional. For example, in the hardcover version on pages 248-249 Theo and his friend Boris go shoplifting at a “discount supermarket” for “…steaks for us, butter, boxes of tea, cucumbers…” Shoplifting at a grocery or convenience store wasn’t an unreasonable scenario, and I didn’t think a thing of it until Donna Tartt reveals the store: Costco. I burst out laughing. Costco is a mega warehouse store that only sells in bulk. The packages all contain multiple items. You wouldn’t steal a single steak, you’d have to hide an enormous pack of five steaks. Then you’d have to get them past the security check. Costco stations people at the door to look you over and read through your list ticking off your purchases. Let’s just say it isn’t likely Boris and Theo would shoplift at Costco if there were any alternatives, which there were. My husband does woodworking, so I immediately noticed on page 418 that Hobie is using “cramps” to hold his wood together. British and Australian woodworkers use cramps. In America — and presumably New York City — we call them clamps. A lot of readers have noted that the drinking age isn’t eighteen as suggested in the book, but is in fact twenty-one. Maybe Tart was channeling her own inner teenager, which was from an earlier time? Other reviewers have also pointed out errors in the technology used at various points. I’m a bit more forgiving about these because let’s face it, it took the author ten years to write the novel and technology changed so much during that period. With some 771 pages to keep track of, I would be more surprised if she had been able to stay consistent. To me, all these little imperfections are rather like the scuff marks on a fine piece of antique furniture or the bubbles in a delicate pane of old glass. They give the novel a unique character. That said, I’d like to let Donna Tartt know that if she needs a fact checker for her next novel, I’d be more than willing to volunteer. Oh yes, Theo’s age is a good one, too. He couldn’t have been 18 when he came back, because he was eligible for the early entrance college program. I actually think the errors are intentional. Theo is not just the narrator, but the author of this work, as we find out on the very last page(or maybe the penultimate), which changes everything. We shouldn’t see these “mistakes” as Tartt’s fumbles, but rather the understandable mixups that would happen while Theo is in Amsterdam on a drug binge writing the book we are reading. Look at the start of the book– it’s a framing device. He’s looking back at his life because, unbeknownst to us at the time, he is contemplating suicide. Oh, I understand Theo is an unreliable narrator. However, the choice of Costco isn’t Theo’s misreporting his world, but Tartt’s lack of knowledge of what a Costco is like. And it isn’t a big deal for anyone who has never been to one. I only mentioned it because it did take me out of the story.